Nobody wrote action music like Jerry Goldsmith. His entire career is filled with scores in each era that saw Jerry truly writing and then rewriting the book when it came to action scoring. Of course, he defined and redefined many more genres than action, but it’s his great rhythmic action writing that gets a workout in this 1996 score for 20th Century Fox’s Chain Reaction. For one, the cue Ice Chase is very clearly an “it could only be Jerry” kind of cue. 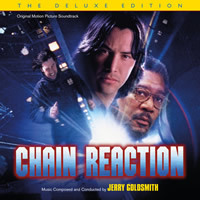 More than doubling the length of the original soundtrack release, we are thrilled to present this greatly expanded Deluxe Edition of Jerry Goldsmith’s Chain Reaction. Chain Reaction (1996) was directed by Andrew Davis and stars Keanu Reeves, Morgan Freeman, Rachel Weisz, Fred Ward, Kevin Dunn and Brian Cox. Two members of an advanced energy experiment--a clever machinist and ambitious female physicist--become fugitives from government operatives who've framed them for murder and the bombing of their lab as part of a concerted effort to bury their project's promising energy research. CDs will begin shipping the week of October 26.